"Keitai" redirects here. For mobile phones in Japan, see Japanese mobile phone culture. Emperor Keitai (継体天皇, Keitai-tennō) was the 26th Emperor of Japan, according to the traditional order of succession. No firm dates can be assigned to this Emperor's life or reign, but he is conventionally considered to have reigned from 507 to 531. Keitai is considered to have ruled the country during the early-6th century, but there is a paucity of information about him. There is insufficient material available for further verification and study. Significant differences exist in the records of the Kojiki and the Nihon Shoki. The Kojiki puts this Emperor's birth year at 485; and his date of death is said to have been April 9, 527. In the extant account, he is called Ohodo (袁本杼). 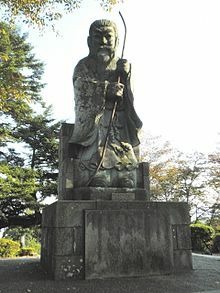 The Nihon Shoki gives his birth year at 450; and he is said to have died on February 7, 531 or 534. In this historical record, he is said to have been called Ohodo (男大迹) and Hikofuto (彦太). In other historical records, he is said to have originally been King of Koshi, a smaller tribal entity, apparently in northern parts of central Japan, perhaps as far as the coast of Sea of Japan. Some modern reference works of history call Keitai simply King Ohodo of Koshi. Keitai's contemporary title would not have been tennō, as most historians believe this title was not introduced until the reigns of Emperor Tenmu and Empress Jitō. Rather, it was presumably Sumeramikoto or Amenoshita Shiroshimesu Ōkimi (治天下大王), meaning "the great king who rules all under heaven". Alternatively, Keitai might have been referred to as ヤマト大王/大君 or the "Great King of Yamato". Keitai was not the son of the immediate previous monarch. According to the Kojiki and Nihon Shoki, Buretsu died without a successor, at which time a fifth generation grandson of Emperor Ōjin, Keitai, came and ascended the throne. If Emperor Keitai began a new dynasty as some historians believe, then Emperor Buretsu would have been the last monarch of the first recorded dynasty of Japan. According to the Kojiki and Nihon Shoki, his father was Hikoushi no Ō/Hikoushi no Ōkimi (彦主人王) and his mother was Furihime (振媛). When Buretsu died, Kanamura recommended Keitai (at the age of 58) as a possible heir to the Yamato throne. His mother, Furihime, was a seventh generation descendant of Emperor Suinin by his son, Prince Iwatsukuwake. His father was a fourth generation descendant of Emperor Ōjin by his son, Prince Wakanuke no Futamata. Genealogy information is supplemented in Shaku Nihongi which quotes from the now lost text Jōgūki (7th century). It says he was a son of Ushi no Ōkimi (believed to be equivalent to Hikoushi no Ōkimi), a grandson of Ohi no Ōkimi, a great-grandson of Ohohoto no Ōkimi (brother to Emperor Ingyō's consort), a great-great-grandson of Prince Wakanuke no Futamata, and a great-great-great-grandson of Emperor Ōjin. The genealogical trees of the Nihon Shoki have been lost, and the accuracy of its account of events remains unknown. This uncertainty raises arguable doubts about this Emperor's genealogy. Although genealogical information in the Shaku Nihongi leaves room for discussion, many scholars acknowledge the blood relationship with the Okinaga clan, a powerful local ruling family or the collateral line of the Imperial family-governed Ōmi region (a part of present-day Shiga Prefecture). This family produced many empresses and consorts throughout history. According to the Nihon Shoki, Ohohoto no Ōkimi, the great-grandfather of Emperor Keitai, married into the Okinaga clan. Keitai's mother, Furihime, was from a local ruling family in Koshi (Echizen Province), so his mother brought him to her home after his father's death. Abundant traditions relating to the family have been passed down by shrines and old-established families in both regions. Regardless of speculation about Keitai's genealogy, it is well settled that there was an extended period of disputes over the succession which developed after Keitai's death. A confrontation arose between adherents of two branches of the Yamato, pitting the supporters of sons who would become known as Emperor Ankan and Emperor Senka against those who were backers of the son who would become known as Emperor Kinmei. Keitai declared his ascension in Kusuba, in the northern part of Kawachi Province (present day Shijonawate, Osaka), and married a younger sister of Emperor Buretsu, Princess Tashiraka. It is supposed that his succession was not welcomed by everyone, and it took about 20 years for Keitai to enter Yamato Province, near Kawachi and the political center of Japan at the time. In Keitai's later years, 527 or 528, the Iwai Rebellion broke out in Tsukushi province, Kyūshū. Keitai assigned Mononobe no Arakabi as Shōgun and sent him to Kyūshū to put down the rebellion. Among his sons, Emperor Ankan, Emperor Senka and Emperor Kinmei ascended to the throne. The actual site of Keitai's grave is not known. The Emperor is traditionally venerated at a memorial Shinto shrine (misasagi) at the Ooda Chausuyama kofun in Ibaraki, Osaka. The Imperial Household Agency designates this location as Keitai's mausoleum. It is formally named Mishima no Aikinu no misasagi. ^ a b Japanese dates correspond to the traditional lunisolar calendar used in Japan until 1873. ^ a b Aston, William. (1998). Nihongi, Vol. 2, pp. 1–25. ^ Aston, William. (1998). Nihongi, Vol. 1, pp. 393–407. Wikimedia Commons has media related to Emperor Keitai. This page was last edited on 11 March 2019, at 16:01 (UTC).